YouTube is the best known way to create and promote videos online and with YouTube partner program most folks are being profitable. We have discussed both about how to monetize YouTube videos and the importance of online video marketing which you can have a glance. In order to get popularity in YouTube one must (channel) have a large subscribers base. The more number of subscribers will lead to more channel views and thus it eventually reaches wider audience. With more subscribers your videos and channel goes viral and they are not just subscribers, they are the fans who enjoy watching your videos. Making frequent updates in your channel and publishing interesting content will gain you more subscribers. In order to promote your videos and channel effectively YouTube offers various tools. We have recently discussed how to add Subscribe link to YouTube videos. Here we will see how to embed or add YouTube subscribe button in your website. If you have a website with decent traffic then you can gradually increase your social media fans and subscribers. Learn how to add Facebook like box in wordpress and social media widgets in Blogger. Before YouTube introduced this subscribe button, people where adding the subscription link URL like this which will take visitors away from your website. Then YouTube offered a subscribe button widget which you can embed it anywhere else. With just one click and without leaving your website people can subscribe to your YouTube channel. Also this subscribe button comes with 6 themes and layouts for standard channels and 3 for paid channels. Here is how you create a YouTube subscribing button for your website. Go to YouTube developer’s page and start customizing the button by entering your channel name, choosing layout and theme. You will then see a preview button towards your right side and at the bottom a button code will be generated like this. Just copy that and paste it in your website. 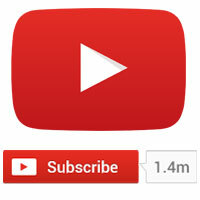 Hope this post helped you with embedding YouTube subscribe button in your website. What is your YouTube channel name? How popular is your channel? What are the ways that you use to promote your videos and channel? Do you think that this widget will help boost your subscribers count? Please let us know by comments.